Today started with more exciting classes! Psychology students went to the escape room, it provided them with a fun and interactive way of learning about humans cope under pressure, while having a great time working out complex tasks. 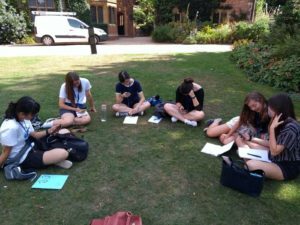 Meanwhile, the English Literature students made the most of the wonderful weather, and spent the morning discussing Modernism and reading poetry in the beautiful gardens of Trinity Hall. The Medicine students learned the basics of suturing wounds, and preparing patients for surgery, while the Physics class explored the quirkiness of relativity. After classes the students took a well deserved lunch break. Some of the students had a shorter lunch break and met our lovely Community Outreach Coordinator Orthi to work on planning the charity auction, and the 5-a-side football game, for later this week. The students do this in order to continue the amazing work being done to raise funds for Sabre Education, our partner charity who are committed to improving the quality of kindergarten education in Ghana. Later, it was time to stretch let off some steam, as sports took place on the Downing Paddock, football, basketball, and tennis were just some of the sports played! Dinner was followed by another lecture, this time on the science of memory. This compelling talk made us all reflect on the way our brains create memories, and how their reliability can be questionable. Once the lecture was over, it was time for more activities! In traditional British fashion, the evening’s activities were changed due to rain. Capture the Flag was replaced by Casino, Board Games and Chill in the Trinity Hall Terrace room. The students took advantage of the more chilled evening as they conserved their energy for the next morning’s classes.